When a machine tool has been in operation for 2〜3 years, the run-out accuracy of the spindle may decline to 0.010mm〜0.040mm at 100mm from the gauge line. The NIKKEN Zero Fit Holder allows correction of this error back to the “as-new” run-out of 0.001〜0.002mm. After “0” Fitting, the Tool Run-out Accuracy is far better and the milling surface finish and quality of the finished components can be improved. Finished tolerances are far more stable when machining holes after adjusting the runout of the tool to less than 0.001mm the variation of surface finish tolerance is minimized producing consistent components. Typical runout can be in the region of 21 microns - when this is reduced to 3 microns, the tool life can be improved by approximately 5 times. Zero Fit Holder has wide adjustment range compared with competitors equivalent systems, and its mechanism performs simple, quick and secure operation. 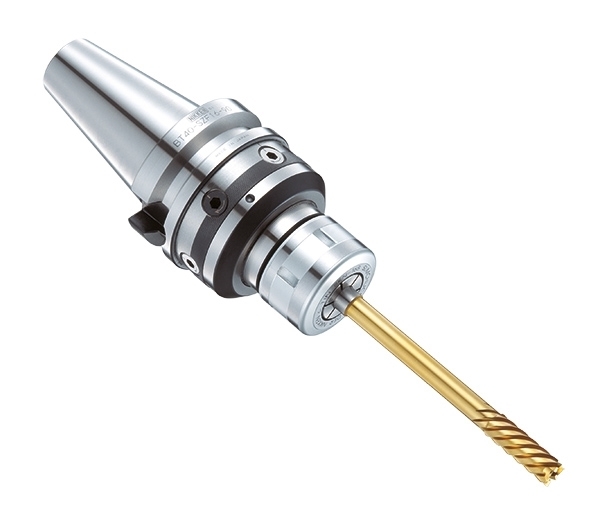 The choice of the Slim Chuck style “SZF” & the Anniversary type Milling Chuck style “CZF” can be selected depending on your application and cutter specifications.